When immersed with the wild horses of the Outer Banks, my greatest concern is not to disturb their patterns. As prey animals, they are attuned to even the slightest changes in their environment. Thus I was quite surprised one day, under a hot mid-day sun, when a small group began to deliberately amble my way. I gathered my equipment quickly, quietly backing away while keeping an eye on the herd. Reaching the dune I had been perched upon, they began to steadily graze. From my new position now in their midst, I lowered myself down to carefully observe their changing movements. Not long after that, one of the mares slowly folded her legs under her body and gracefully collapsed onto the soft ground for a nap. It wasn’t long before the others joined her, leaving their stallion to stand watch. I was almost breathlessly still watching this magical moment of peace, vulnerability, and acceptance of my presence. 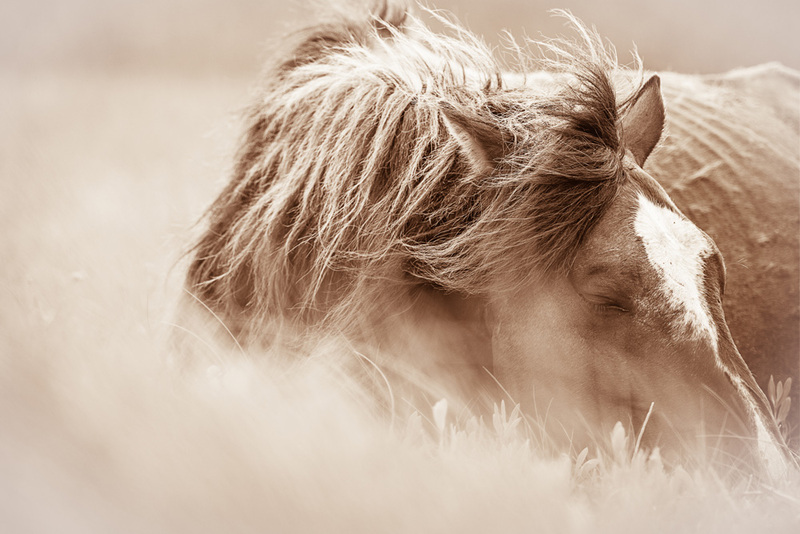 I was in the company of sleeping wild horses, an experience I will never forget.